Happy Republic Day Everyone 😇 I love these patriotic vibes. Can't believe it's the last week of January. It feels like I celebrated New Year Yesterday! Coming back to the point, you all know I'm associated blogger of "The Nature's Co.", and whenever I receive updates, I share with you all :) So today I'm back with some exciting updates 😇 Scroll down below to explore. The best is on parade this Republic Day at The Nature's Co.
Rejoicing the 68th year of the R-DAY fervor, The Nature’s Co. announces the #SaleParade with an "up to 68% off" till the 29th of January’17. 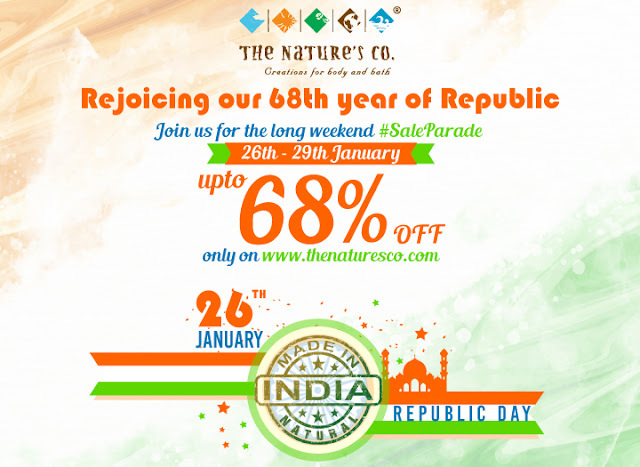 This shopping extravaganza, revitalizes the feeling of nationality, patriotism, and responsibility towards the nation, as TNC imbibes "Made In India" all across their natural range of vegan and PETA certified, skin, hair, wellness and body care products. Adding to the vehemence, as we all celebrate the Indian pride of going #DigitalIndia and #Cashless payments, www.thenaturesco.com gives you all an eco-friendly e-store, so you can order from a fabulous range of products at unbeatable prices anywhere, from your home, office, or even on your handphones while your on the go. A sale that's absolutely worth a salute! Experience an enhanced care for beautiful hands as you cocoon them in the purifying hydration of Vanilla. This lusciously enriched blend of organic Vanilla, Shea Butter , Kokum Butter, Olive Oil, Wheat germ Oil, Apricot kernel Oil, Sweet Almond Oil, Avocado Oil, Jojoba Oil, Vitamin – E, Coconut Oil, Grape seed Oil & Vegetable Glycerin gives the hands the gift of moisture. Be lured with its invigorating and sweet fragrance which will ignite your senses while nourishing, protecting and moisturizing the hand & cuticles. A smudge of this hand and cuticle cream penetrates deeply, enveloping with rich moisture and keeps the skin soft, by visibly smoothening the skin, leaving a more supple look and divinely scented. This hand remedy packed with natural wonders comes handy to revive dry hands, especially on cold weather and definitely tops all our must - haves list! A little TNC birdy just whispered that applying the emulsion at bed time, just before your beauty sleeps gives the best results. Get your hands on this ultimate hand & cuticle care emulsion exclusively at The Natures Co. (Direct Link) for Rs. 495/- only now! Nice post 👌 Well explained. I've never really heard of these brands before but they look good. Nice post! I will try Naturesco. the products are nice, and with the discounts, it makes room for more interest in them all. thanks for this... nature is always a first in such products. great. the products you review are always so nice. Those are reslly great! I wish we had somethonh like this here in Pakistsn also.